Epic 850/950 Cleaning System Clean the print head and platen roller in seconds for clear consistent tickets! Waffletechnology is an advancement in cleaning card technology. The cleaning waffles are flexible raised platforms, that allow the card to clean thoroughly areas within the thermal printer. Now more paper flash and adhesive residue is removed making your labels cleaner, crisper and more reliable. 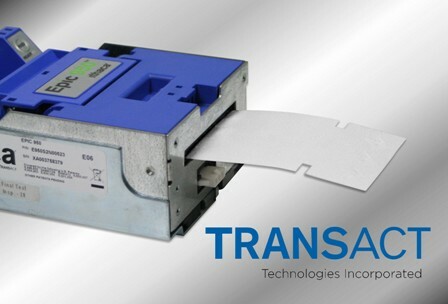 Designed specifically for the TransAct Epic 850 and 950 Cashless Ticket Printers, this product featuring Waffletechnology, is approved by TransAct Technologies. This product was developed and tested by engineers at KIC Products, along with cooperation from TransAct Technologies, to be an effective means of maintaining this equipment. TransActSupplies.com offers a full line of cleaning cards & supplies for Thermal Receipt Printers, Credit Card Machines, Bill Acceptors and Slot Machines. Our presaturated cleaning cards and products are tested and approved by OEM's and manufactured to precise specifications using approved materials.